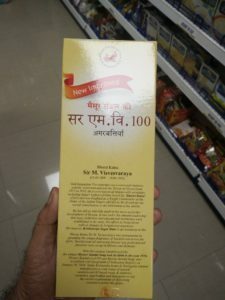 During my usual grocery shopping at the nearby store, I happened to see this interesting pack, written as Mysore Sandal Sir M V 100 Agarbathies. 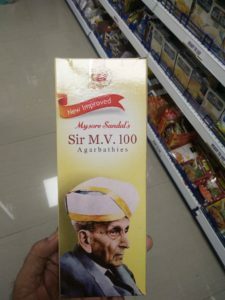 A detailed look revealed that this special pack was a tribute to the genius engineer Sir Mokshagundam Visvesvaraya, popularly known as Sir MV. The brand is owned by world famous Karnataka Soaps and Detergents Limited, (KSDL) which makes Mysore Sandal Soaps. KSDL is World’s largest producer of Sandalwood oil. Mokshagundam Visvesvaraya, popularly known as Sir MV was an engineer, scholar, statesman and the Diwan of Mysore from 1912 to 1918. He is a recipient of the Indian highest civilian honour, the Bharat Ratna and was knighted by the British. His birthday day , 15 September is celebrated as Engineer’s Day. He was the chief engineer responsible for the construction of the Krishna Raja Sagara dam in Mysore as well as the chief designer of the flood protection system for the city of Hyderabad. SIR MV is truly a Bharat Ratna and this is a great tribute by Karnataka Soaps and Detergents Limited.